A concept chip demonstrated yesterday from Intel's Tera-scale Computing Research Program contains 48 cores on a single silicon chip. Using only as much electricity as a single Intel processor, this experimental chip could enable future generations of laptops to "see" just as we humans view the world through our eyes. 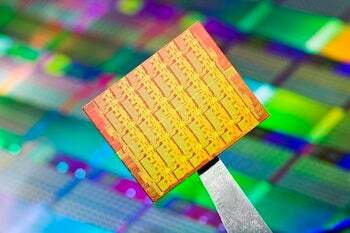 Intel engineers envision this multi-core chip as the future of cloud computing. As all 48 cores of this postage stamp-sized chip use 125 watts at their maximum performance, the advent of similar chips could herald a new era of energy-efficient, smaller data centers, making cloud computing less expensive and more portable. Applications for these chips include the rapid processing of images, allowing for new methods of interacting with computers with a camera, rather than with keyboards or mice. With so much processing power available in a small area, "virtual dance lessons" and more intuitive controls for video games could become commonplace for laptops. It could be a while before these chips make their way to the consumer market. Intel plans on sharing 100 of these prototype chips with researchers in order to develop software specially honed for the 48-core chip, but details of the prototypes' availability to industry and academic experts are yet to be released. More information on the chip's design and architecture will be presented at the International Solid State Circuits Conference in February in San Francisco. Follow @geektech on Twitter for more news on hardware, hacks, and cutting-edge tech.